It’s been announced that the fan vote for the upcoming Heisei Rider Vs Shōwa Rider: Kamen Rider Wars feat. Super Sentai film to decide which side comes out victorious will also decide the ending theme song. Dependent upon which side wins the battle in the film, a result that fans are to decide by online and in theater polling, the latest ‘Wars‘ film will feature one of two different ending songs. Should the Heisei Riders win the poll, the film’s ending theme will be Mission Complete by the Kamen Rider GIRLS. Should the Shōwa Riders win the poll, the ending theme will be Dragon Road 2014, featuring Akira Kushida with the Kamen Rider GIRLS band. The original Dragon Road song was the theme to Kamen Rider ZX’s one and only starring role in the 1984 TV special, Birth of the 10th! Kamen Riders All Together!! 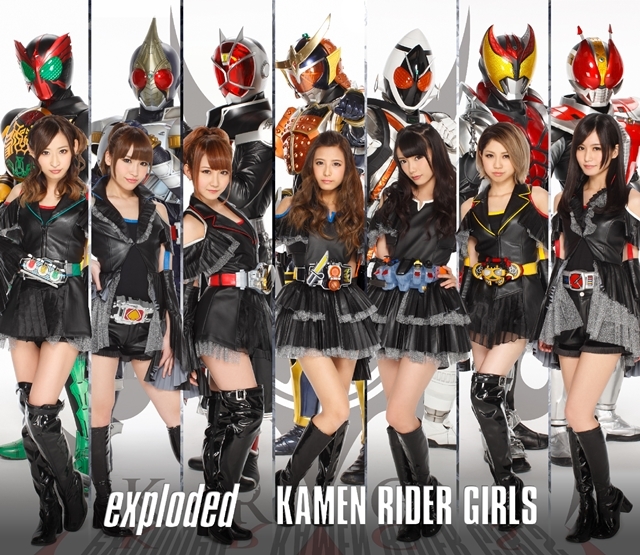 Both songs will be featured on the second Kamen Rider GIRLS album, Exploded, to be released on March 19th. Heisei Rider vs. Shōwa Rider: Kamen Rider Wars feat. Super Sentai, the third in the ‘Wars’ film series which brings heroes from different franchises together, will be released on March 29th and is directed by Takayuki Shibasaki (OOO Wonderful, Cho Den-O: Episode Yellow) and written by Shoji Yonemura (Kamen Rider Kabuto).